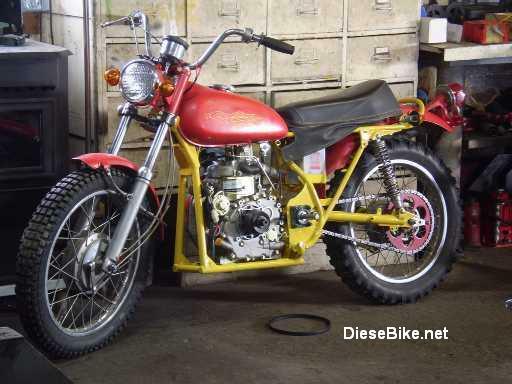 Daniel Mould's Diesel Motorcycle Project using a 1973 Yamaha Enduro. The build started with an extremely ugly yellow frame covered in mud, snow, and oil. All the parts were there except for a good seat. The previous owner had tried to customize it with a new paint job, but apparently didn't get the look he wanted. 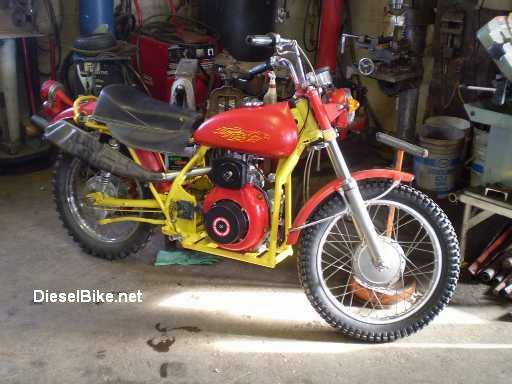 So there sat this ugly yellow and red bike in the middle of a junk pile just waiting to be restored. But the "restoration" it got wasn't what it expected! I ended up buying it for $325 Canadian. It had a seized engine, locked up rear wheel, and a shot electrical system. But luckily, these were things I didn't really care about. After dismantling the entire bike, I was pleased to discover excellent brake pads and wheel bearings. Aside from being covered in a little rust, the pads had lots of life left. Next was the tires themselves, which were another story. The rear tire is shot, while the front is useable but obviously old. The bike sat like this until I had a week off school. I spend the entire week fitting the engine, and buying parts. 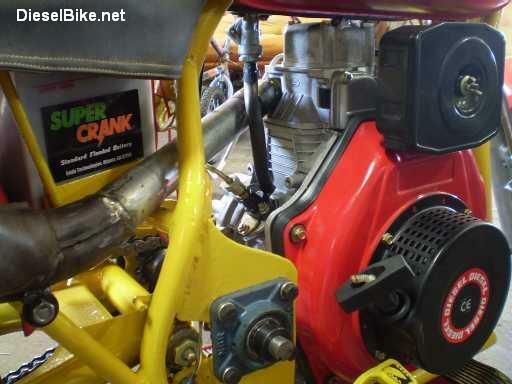 Fitting the 6hp engine was one of the hardest parts, but still proved to be fairly simple. In this, I mostly guessed and eyeballed measurements, keeping it as simple as possible. For the main engine housing, I used 1" pipe from another rusty scrap pile (I'm beginning to like them!). Only having a week off, I abandoned the idea of bending pipes and went with a squarish utilitarian look. The engine was able to fit within 3 days of work. By that time I was feeling pretty confident. But mounting the jack-shaft bearings was even worse. I was about to go redneck with some trusty angle iron until I found an old 1/4" steel plate. With this I made 2 solid brackets to hold the jack-shaft in place. These plates easily took the most time. Once these were installed, the majority of the frame modifications were done. As the bike took shape, The last "hard" part was the exhaust. I tried everything from a straight pipe to the bike's old exhaust. The straight pipe was unbearably loud, so I used the bike's two-stroke muffler. If I had more time, I would have put the exhaust out front, and bent it backwards like a normal bike. I ended up going straight through the middle of the frame and into the reversed muffler. It worked well, but the fuel line comes dangerously close and sometimes melts. This will be a simple fix when time permits. At this time, all that was left was minor touchup details. I completely redid the wiring system to make it more simple. This involved taking everything out except the bare essentials. I now have full functioning lights, turn signals, and starter. The only thing I'm missing is a horn, but I figure I will make enough of a scene that it won't matter! Following this was a quick paint job with a brush (If I was to spray paint it, it would take forever). Through much criticism I painted it yellow. I got lots of "yuck" and "gross" comments through on ear and out the other. But in the end, it didn't look too bad. Its not a conservative colour scheme by any means, but I like it. Because I'm still trying to find the right sized comet 40 clutch system, it will take a while. So for the time being, I devised a centrifugal belt drive. Although I only got up to 40 km/h with the single speed clutch, I had loads of fun. Gobs of knocking torque sent me flying over snow drifts and ice. I learned that day that front brakes and ice don't mix... twice! But on dry gravel or packed snow, it ripped around like no tomorrow. By the time I was frozen, I had become one with diesel exhaust! Once the comet is on, the only other thing is my alternative fuel system. 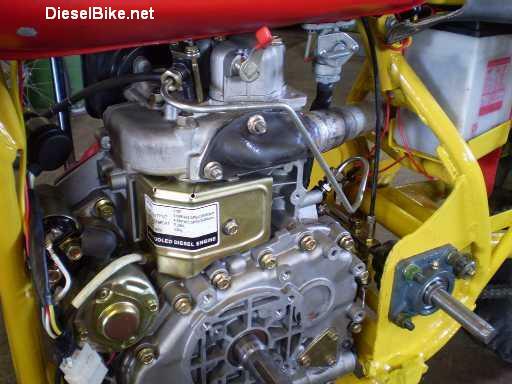 I plan to use the two-stroke's oil tank reservoir for veggie oil or fryer oil. We grow huge amounts of canola here, and my cousin has lots of used fryer oil. So finding fuel will not be a problem. Aside from the many doubts I received, The bike turned out better than I had ever expected. I plan to use it for both a school commuter, and a crop-checker for the farm. Even though it hasn't been out on the streets yet, I have had lots of people interested. The biggest thing that piques their interest is its simplicity. The bike itself took no more than a week and a few nights to complete. This makes it possible for anybody to throw one together. If you don't mind diesel exhaust, its hard to beat!